Luxury, Spectacular views & beach in a beautiful bay of Huatulco.Private pool. 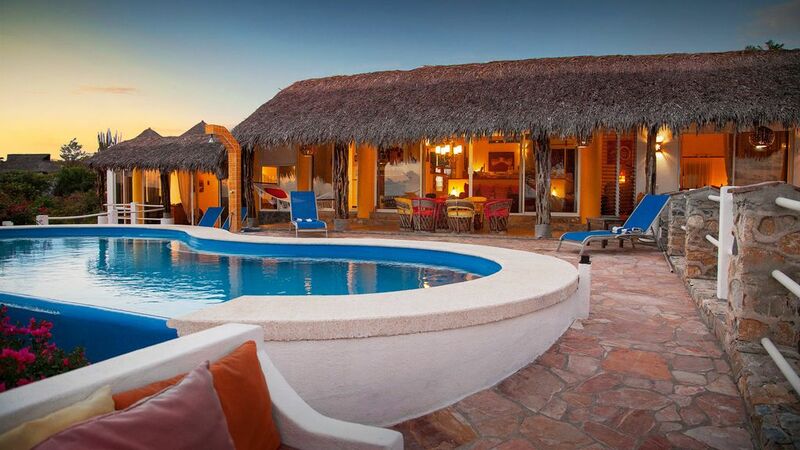 Located just 15-20 minutes from Huatulco International Airport is Salchi Bay and this private luxurious oceanfront villa with 3 spacious Bedrooms all with en suite bathrooms and air conditioning. MB has King size bed and both guest rooms have 2 queen size beds. The stunning vista can be enjoyed from every room of this designer decorated villa. Relax on the sundeck beside the private beautiful infinity pool, or walk 2 minutes to the stunning beach. The Villa is complete with large screen LCD HDTV, surround sound, DVD, Starchoice Satellite, and Wireless Internet (see note at bottom). Kitchen is completely stocked with utensils. Huatulco has many fine restaurants, great shopping, a Market and Theater. Available Tours for Deep sea Fishing/kayaking/whitewater rafting/ATV rentals/horseback riding.This is a fantastic Villa for family reunion's, Weddings, or a romantic getaway. Located 15-20 minutes from Huatulco Airport awaits Paradise in the name of Salchi Bay. This private secluded Bay is comprised of 36 custom built homes with, one of the most beautiful beaches you will ever find. The villa faces the Pacific Ocean which provides tropical breezes in the daytime, and the Sierra Madre mountain breezes in the evening giving a constant perfect temperature. Fresh fish and lobster can be purchased from friendly local fishermen, or they will take you to catch it yourself. Golf, shopping, and entertainment are all just a 30-45 minute drive into Bahias de Huatulco. Peurto Escondido is a 1h-20 minute drive west, and historic Oaxaca City a 6 hour drive north (or 35min flight). We have security . New Kitchen with stainless steel appliances (2016) Beautiful Gardens.. Note: Due to this property's secluded location, the wireless internet can often have a weak signal based on weather conditions and other factors. Not suitable for large Downloads or uploads.Or streaming like Netflix. We use mainly for E-Mail only. we also have a water cooler.5 Gallon bottles delivered at 25 peso's per delivery. There is a bbq on back patio. Smoking outside only. Arrangements for maid and cook service available upon request, extra charges will apply . No home phone provided and cell phone signal sometimes weak due to the location. This is our 3rd time staying at this very special casa with family and friends.The hosts make every effort to offer everything you need for a spectacular,comfortable and worry free escape from ordinary life...truly an exceptional and well equipped destination.We are so grateful to have discovered this little piece of heaven in sunny Huatulco, and plan to return again, and again...and again! To get to Salchi where the house is located takes some work as the roads are in bad shape ( we rented a Jeep) but once in the house is worth it . The people are very friendly in the neighborhood . We were able to get fresh fish , lobsters fresh from local fisherman . The owner terie has a ground keeper ( Mario) that can get anything for you . The owner tricia is good to work with and provides a lot help to organize your visit. This location is a bit far from the city , Huatulco , so you need to be use to drive around Mexico . It is a great house and place. Trish and Terry are wonderful hosts and ensure that we had a fantastic time. Beautiful location on a private and extremely clean beach. Able to see whales migrating from the house level. Lovely and secure residential area out of town but close enough to hit Crucecita and the bahias. Plenty of room for our family of eight with children ages 5 to 11. The Manta Raya hotel has excellent food and is within walking distance, and Trish can arrange for a deliciously prepared home cooked meal at super reasonable prices. I'm so glad you and your family had such a great vacation. It was a pleasure to meet you all. You were such wonderful guest's . I'm glad you had fun exploring the area. Trish is the absolute perfect hostess, everything was wonderful. A house that feels like home and leaves you needing nothing. It was everything we expected and more. Having Manataraya down at the beach was the icing on the cake for me as I did not have to cook any meals and the food is very good. Reto and his staff do a wonderful job. If you do decide to cook all or any of your meals, the kitchen has everything you might need. We have rented many homes in North America and Europe and this house is the best equipped, comfortable and clean house we have rented with friendly, helpful neighbors close by. You were the perfect Guest's ! I am so glad you enjoyed your stay....looking forward to your return one day ! Always happy to get review's. I highly recommend this casa for it's luxury, location,amenities and artful design and decor. This place was absolute perfection for week one with 4 of my girlfriends, and then the perfect respite for my husband and I to enjoy a quiet, restorative and delightful week of ocean views, beachtime, spectacular sunsets and most comfortable surroundings.Everything you could wish for was right there....except for another 2 weeks which I desperately longed for on fly home day! Mexico and this special casa are what I work so hard for the rest of the year! Thank you so much. Were so glad you enjoyed your stay.....you were the perfect guests and I look forward to your return . My husband and I recently returned from a 2 week vacation at Casa Collier. I feel as though mere words are not enough to describe not only this beautiful property but the vacation of a lifetime. I was initially worried about booking a property so far away and not knowing if the property would look like the pictures. Not only did the property exceed the pictures it was BREATHTAKING!! Everything from the 1st phone call with Trish until the time we arrived back home was seamless. I read all the previous reviews and I thought to myself (can this property and this place really be as good as everyone say it is)... YES IT REALLY IS!! I would highly recommend this property to anyone looking for a relaxing getaway, you will NOT be disappointed!! Trish.. thank you again for everything you did for us and for making our trip, the trip of a lifetime!!! Thank you for such a lovely review!...So glad you enjoyed your stay. Look forward to your return!!! Everyone said you were the "perfect Guest's", and enjoyed your company. Located 15-20 minutes from Huatulco Airport awaits Paradise in the name of Salchi Bay. This private secluded Bay is comprised of 36 custom built homes with, one of the most beautiful beaches you will ever find. The villa faces the Pacific Ocean which provides tropical breezes in the daytime, and the Sierra Madre mountain breezes in the evening giving a constant perfect temperature. Fresh fish and lobster can be purchased from friendly local fishermen, or they will take you to catch it yourself. Golf, shopping, and entertainment are all just a 30-45 minute drive into Bahias de Huatulco. Peurto Escondido is a 1h-20 minute drive west, and historic Oaxaca City a 6 hour drive north (or 35min flight).We have security ( though never needed) as Salchi Bay and Huatulco is one of the safest places to visit, as you can see by our reveiws.